There’s a lot of coaches with doubts on Maxy, but is the doubt real? Big Max Gawn had his biggest season to date last year averaging 111 points in his 22 home and away games. Coming back from an injury interrupted 2017 Gawn found himself in most teams with coaches confident in his ability to get back to his best, and that he did. Last year Gawn averaged a huge 45 hitouts a game, the most in the competition, meaning that he has the ability to get himself to rocket himself to a high score before he even needs to pick the ball up. Gawn has always had the ability to get hold of the ball, thanks to his great marking powers, and strong build. Meaning you can lock him in to keep scoring should he stay fit. Gawn’s ability to score massive scores can be the difference between winning and losing match ups, and this season, lacking Tom Mitchell’s consistent 150s, the ability to put the C on Max could come in very handy having scored above 110 15 times last season. Max is clearly the number two ruckman in Fantasy right now sitting behind Brodie Grundy. At the time of writing this article he sits in 19% of teams, making him the fourth most picked ruckman in the game. The only two other than Grundy above him are Dary Cameron and Fort who are bench players. There is a distinct lack of set and forget ruckman this year beyond Grundy and Gawn. The biggest reason why Gawn shouldn’t be picked is the Demons acquisition of former Kanagaroo’s ruckman Braydon Preuss. Melbourne aren’t giving away their plans on how Preuss will be used, but they were quite adamant in their need for a second ruck man, and over the post-season there has certainly been lot’s of chatter in the papers suggesting Melbourne might follow the Eagles successful two-man ruck strategy. Towards the end of 2017 Gawn’s average plummeted thanks to scores of 65 and 75 as Melbourne trialled a ruck partnership of Gawn and Pedersen. Thankfully that was dropped for 2018, but could we see a return of this strategy now Preuss in there? Should Preuss be named round 1 then there isn’t necessarily the need to panic. Yes Gawn’s output will undoubtably drop as his time in the middle of the park decreases, but as mentioned above, Gawn has an ability to take marks, and with that he also can kick goals, meaning should he have to spend time in the forward line, he will most likely increase his scoring ability from set shots, and hopefully only drop his average slightly. If Preuss plays alongside Gawn, what does Max average? QUEEN – Last year Warnie called Gawn a must have and named him as a King. This year he isn’t a must have, but in saying that there really isn’t too many other options that have his ability to score 110+ on a regular basis. I would certainly be looking at how Gawn and Preuss are used in the Pre-Season before taking Gawn out of my side. At this stage though Max is beyond doubt the second best ruckman in the competition, and I wouldn’t be pushing any panic buttons anytime soon, as the lack of options other than him, with his form is far and between, with or without Preuss playing. Predicting Gawn’s average this season is difficult giving the difference in score should Preuss play. I’m backing him to still be dominant though, and once again for Gawn to show the competition why he is the No1 pure ruckman. Do you think Preuss will be part of Melbourne's 22 early in the season? FOLLOW ME ON TWITTER: @triggywiggy for all thing AFL Fantasy (and more). Got something to say about the deck? Use the hashtag… #DeckofDT. If people are confident pruess plays, why aren’t we picking him? I think it’s purely based around the uncertainty of whether or not he plays, and what his role is if he does play. I personally think that both rucks will play, however, who is to say after 3-4 games it isn’t working and Preuss gets dropped? Also, who’s to say whether Preuss (or even Gawn for that matter) doesn’t play more as a key forward? 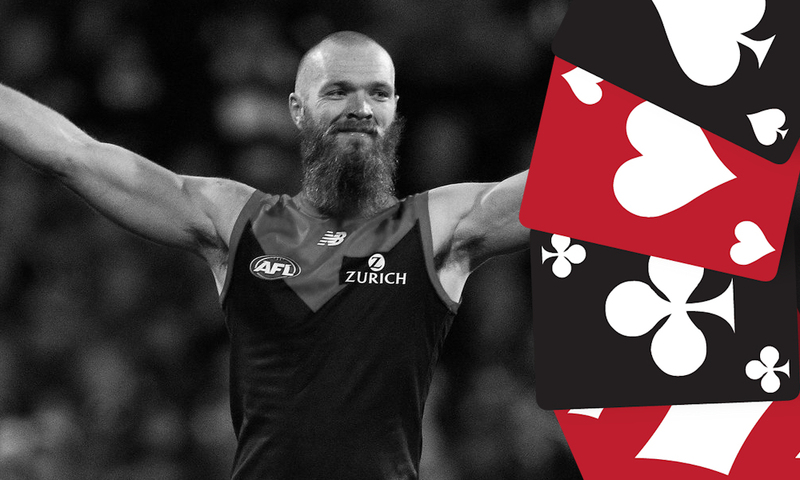 There is certainly the possibility that selecting Preuss could pay off in a big way (I did hear that Melbourne were trialling Gawn playing as a key forward, which isn’t an unthinkable idea considering his contested marking prowess), however, I just feel like there is too much uncertainty regarding his job security and his role to take the gamble. Gawn key forward no chance fellas. Melbourne aren’t going to turn an All Australian ruckman into a forward to make way for a player who couldn’t get a game last year. Nice article! Umm… Why did you block me on Twitter?? ?